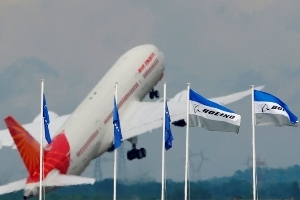 State-owned Air India has shown improvement both in terms of operational as well as financial parameters in 2013-14 over the previous fiscal, the government said in Parliament on Tuesday. "Passenger revenue has increased from Rs 12,494.44 crore (Rs 124.94 billion) in 2012-13 to Rs 14,300 crore (Rs 143 billion) in 2013-14, i.e by 14.45 per cent," Civil Aviation Minister Ashok Gajapati Raju Pusapati said in the Rajya Sabha. The net loss of the carrier marginally decreased to Rs 5,388.82 crore (Rs 53.88 billion) in 2013-14 as against Rs 5,490.16 crore (Rs 54.9 billion) in the previous fiscal. The minister also informed that passenger load factor of Air India improved from 72.4 per cent in 2012-13 to 73.6 per cent in 2013-14. The passengers travelled on total network also increased to 15.3 million, up 8.5 per cent in the last fiscal. Replying to supplementaries, Pusapati said Air India joining the Star Alliance would lead to seamless travel for passengers and the revenue may increase by 4-5 per cent. He also said government was committed to increasing air connectivity. To another question on airports of Chennai, Tiruchirapalli, Coimbatore and Madurai in Tamil Nadu, Pusapati said construction/modification work of terminal buildings and runway extension to increase the peak passenger handling capacity and flight handling capacity have been undertaken by the Airport Authority of India at there. "AAI has earmarked a provision of Rs 42.5 crore (Rs 425 million) for procurement of security equipment and surveillance systems for both the domestic and international airport terminals at Chennai, Tiruchirapalli, Coimbatore and Madurai airports at Tamil Nadu," he said. Replying to supplementaries regarding privatisation of Chennai airport, the minister said that no decision has been taken. "We have not yet taken any decision. “Every suggestion will be examined and decision will be taken on merit," Pusapati said.